Anti-Brexit demonstrators wave EU and Union flags outside the Houses of Parliament in London, Britain, Jan. 30, 2018. Britain is a "divided and polarized" nation after its vote to leave the European Union, with the referendum exposing and exacerbating divisions across society, according to new research on the societal effects of the so-called Brexit. The splits cut across political lines, with sharp divisions emerging on key values such as attitudes to ethnic minorities in Britain, say report authors from the "UK in a Changing Europe" program. In the wake of the vote to leave the European Union, the prime minister said Britain was uniting. But in reality, the opposite is happening, Theresa May is presiding over a divided nation, according to one of the report's lead authors, Professor Anand Menon of Kings College London. "Divisions between towns and cities, between north and south, between the different nations of the United Kingdom, so Wales voted leave, England voted leave, Scotland voted remain, Northern Ireland voted remain; between young and old, between people with degrees and people without degrees," Menon told VOA. 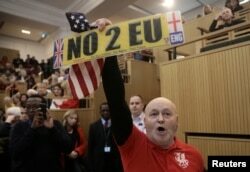 A demonstrator holds a pro-Brexit sign and a U.S. flag, as the speech by the Mayor of London, Sadiq Khan, is interrupted at the Fabian Society New Year Conference, in central London, Britain Jan. 13, 2018. "And it added to all those things that it revealed and brought out into the open a new divide, which is the divide between leavers' and remainers'," he added. Researchers identified another emerging divide. "Leave" voters thought equal opportunities for ethnic minorities have gone too far, while those who felt such opportunities have not gone far enough showed a strong tendency towards voting "remain." The divisions do not follow traditional party-political loyalties. "A very good predictor on how you voted in Brexit is whether you believe in the death penalty or not," said Menon. "And that's nothing to do with our traditional politics, that's values." Attacks on ethnic groups, so-called hate crimes, increased by more than 40 percent after the referendum, according to government figures. That's evidence, say analysts, that the vote has far deeper significance than the simple matter of Britain's EU membership. If anything, the referendum has made us feel more divided and maybe even made us more divided than we were before," said Menon. Professor Menon adds the "values" divide could explain why there's little sign that Britons are changing their minds, despite mounting evidence of the economic cost of Brexit. A leaked government impact assessment this week showed that leaving the EU could reduce growth in the British economy by up to eight percent of GDP during the next 15 years.